The following are some early records of the Kornrumpf surname in Germany. This map shows the towns and cities where our Kornrumpf ancestors lived. 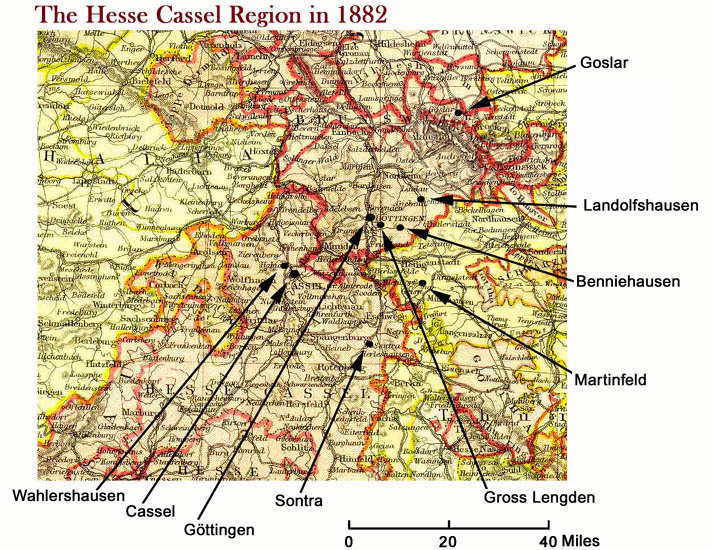 Most of the early Kornrumpf records were found in Hesse Cassel in an area that spans only about 40 miles. The first recorded use of the name was in Sontra in 1470. Later records are found to the north. About 1640, during the Thirty Years War, Cyriaus Kornrumpf moved to the village of Gross Lengden near Göttingen. Kornrumpfs have lived there for more than 10 generations. This page lists some of the towns where the early records have been found. The list is not exhaustive. It was collected from various sources which have not been verified. If you find errors in this information or have other early records to share, please contact the webmaster. Sontra is a village located approximately 30 kilometers southeast of the city of Kassel in the Hesse region. The earliest known records showing the Kornrumpf surname were found in Sontra. 1470 Records show that Berlt Kornrumpf paid for a house in Sontra, a small village to the south east of Kassel. 1534 - 1606 The following records about Johannes Corrumpf have been found in Sontra. 1534 He studied at Marburg university. 1545 He was a teacher in Sontra. 1555 He was reverend in Weissenhasel. 1556 He was referred to as "pious and learned". 1606 He died on November 15, 1606 in Berneburg, Sontra, Hessen, Deutschland. His birth date is estimated at about 1520. 1563 Birth of David Kornrmpf, a baker and mayor. 1584 David Kornrmpf moved into the town of Sontra. 1633 Death of David Kornrumpf October 11, 1633. 1. Conrad (Konrad/Kurt) Corrumpf, born in 1595, a reverend. 2. Joachim Kornrumpf, a baker. 1. Conrad David Corrumpf, baptised September 30, 1632. Sponsor was reverend Conrad Corrumpf. 1654 - 1669 Philipp Corrumpf married Beate Gudenus on February 6, 1654 in Sontra, Hessen-Nassau, Preussen. This record and the birth records of six of their children between 1658 and 1669 are found in the International Genealogical Index. Gross Lengden is a small village about 5 kilometers southeast of Göttingen. Kornrumpf families have lived in Gross Lengden since the time of Thirty Years War (1618 - 1648) and Kornrumpfs are still living there today. 1668 Christoph Kornrumpf married Anna Hampe, daughter of Hans Hampe on October 27, 1668. 1669 Maria Kornrumpf, daughter of Cyriax Kornrumpf, married Andreas Bleier on November 2, 1669. 1693 Niclas Kornrumpf married Catharina Margarethe Hoppe, daughter of Andreas Hoppe on December 5, 1693. 1754 Johann Friedrich Kornrumpf, son of Lucas Kornrumpf, married Anna Catharina Bleierts on November 19, 1754. 1776 Margarete Elisabeth Kornrumpf, daughter of Matthias Kornrumpf, married Arend Christoph Lindau of Benniehausen, son of Christoph Lindau, on February 13, 1776..
1777 Johann Friedrich Kornrumpf, son of Matthias and Kornrumpf, married Catharina Margarete Becker, daughter of Simon Becker, on November 23, 1777. 1792 Maria Anna Catharina (widow Kornrumpf), daughter of Rudolph Hampe, married Johann Christian Bornemann of Ebergoetzen, son of Albrecht Bornemann on December 30, 1792. 1798 Mathias Kornrumpf, a soldier, son of Johann Friedrich Kornrumpf married Sophie Margarethe Wecker, daughter of Ernest, master mason, on January 14, 1798. Wahlershausen is a village near Kassel and is just outside the city limit today. The parish register for the years 1624 through 1702 include the following records. 1681 Johannes Kornrumpf is mentioned as a sponsor in Wehlheiden. He is described as Dr. Bourdon's servant (worker). 1698 Johannes Kornrumpf dies in Wehlheiden at age 48 on July 12, 1798. His wife is Anna Martha, who was also mentioned in the church register in 1688 as a sponsor. 1685 Hans Wilhelm Kornrumpf from Bischoffshausen [Bischhausen] near Lichtenau is mentioned as a sponsor in Wahlershausen. 1686 Wilhelm Kornrumpf, born in Wahlershausen, died in infancy. 1693 Johann Hermann Kornrumpf, born in Wahlershausen, died in infancy. 1694 Johannes Kornrumpf, born in Wahlershausen, died at age 3. Sponsor was Johannes Kornrumpf of Wehlheiden. 1702 Johann Christian Kornrumpf, citizen of Kassel was mentioned as a sponsor in 1702 for Georg Steuber's son. 1723 Johann Adam Kornrumpf. Died at age 6. 1729 Hans Wilhelm Kornrumpf death on April 16, 1729. His wife was ?? Heusner. Freiheit is located about 30 kilometers northeast of Göttingen, near Osterode/Harz. A list of house owners between 1707 and 1766 lists Elisabeth Kornrumpf, Brauerin (brewer), Mittelgasse. Benniehausen is a small village located approximately 8 kilometers southeast of Göttingen. Bischhausen is a small village located approximately 10 kilometers southeast of Göttingen. 1745 Johann Jürgen Kornrumpf from Gross Lengden married Dorothea Elisabeth Schachtebeck on June 13, 1745. 1789 Johann Christoph Kornrumpf, son of (sackmacher) Johann Christoph, married Ilse Dorothea Kauffmann, daughter of Ackermann (farmer) Johann Joachim Kauffmann, on October 18, 1789. 1794 Johann Heinrich Kornrumpf, son of (farmer) Johann Jürgen Kornrumpf, married Anna Maria Kauffmann, daughter of (farmer) Johann Joachim Kauffmann, on June 22, 1794. Waake is a village located approximately 6 kilometers east of Göttingen. 1707 Andreas Kornrumpf married Anna Martha Grethe on January 24, 1707. 1736 Anna Elisabeth Kornrumpf married Christoph Keyser on April 2, 1736. Lüderbach is between Eschwege and Eisenach. 1771 Anna Catharina Kornrumpff born July 26, 1771. Married Johannes Battenhausen (1777-1847) from Netra in 1801. Died May 11, 1844 in Rittmannshausen. 1842 Johann Georg Kornrumpf. Born August 12 1842. His father was Caspar Kornrumpf. Married Barbara Eva Rabe on September 23, 1872. 1666 Elisabeth Kornrump married Matthias Reinhardt. She was born about 1645 and died October 20, 1679.